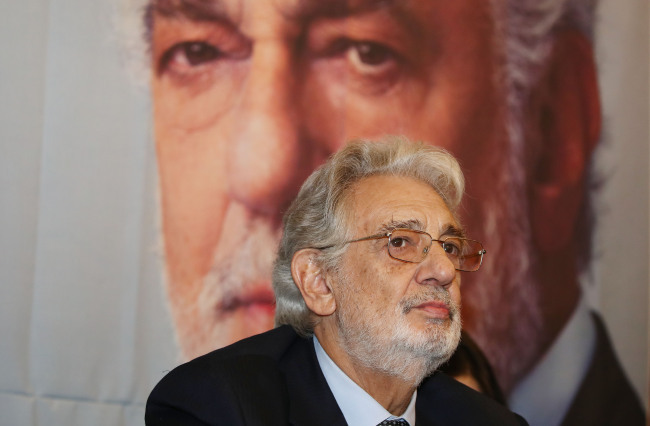 Legendary opera singer Placido Domingo is to hold a concert Friday at Jamsil Indoor Stadium in Seoul, marking the Spanish tenor’s seventh visit to Korea since his first in 1991. “I have been different times in Korea for probably the last 20 years or more, and I have always enjoyed your city and the public who is so warm and love classic music and opera,” said Domingo during a press conference held on Wednesday at Lotte Hotel in Jamsil, Seoul. Domingo also praised “the sensibility of the people in Korea, the feeling to take the music in such a strong way,” as part of his pleasure in returning to Korea. “(The song) is the music that my parent used to sing,” said Domingo. In fact, it was his mother who recommended the song for the “Three Tenors” concert. “In those days, my mother was quite sick, and she could not come to Los Angeles and the performance. But she heard me singing on TV (and) the success, the way the public reacted. She (later) said to me, ‘I told you, I told you to sing this thing,’” Domingo recalled. Pepita Embil, Domingo’s mother and soprano, passed away later that year. On Friday, Spanish soprano Ana Maria Martinez -- longtime partner of Domingo –- will join Domingo on the stage. The legendary tenor is also expected to sing a version of a piece of gagok, or lyric song. Theece expressing a longing for Kumgangsan has been sung by many local opera singers including Jo Su-mi. Domingo, who arrived in Seoul on Tuesday after Sunday’s concert in San Francisco, was energetic. “It is passion that I feel,” Domingo answered when asked what drove him to keep singing on the stage. “I have had life with music, which has been so extraordinary. For me, the years are passing, and of course I realize that one of these days perhaps I won’t be able to sing any more. (But) that gives me even more passion and willingness to continue doing this absolutely outstanding career, which is a privilege. It is a privilege for us to make the public happy,” he said. “One of the things me keeps me going is because I have this competition of Operalia, (which has continued for 26 years) which I started,” Domingo said. There are more and more singers around the globe coming to compete, and the opera community is the other reason for his great enthusiasm for music, Domingo added. Operalia, The World Opera Competition is an annual international competition for opera singers, founded in 1993 by Domingo.